A few weeks before he died, Howard Zinn had lunch at the Warwick Hotel in Manhattan with New York Times columnist Bob Herbert. Their topic of conversation was, of course, social justice. A year later, the streets of London erupted with citizens who were engaging in Zinn’s favorite pastime: active democracy. Students gathered in protest at Parliament Square, but there were also other protests in Oxford, Scotland, Glasgow, Cambridge, Birmingham and Leeds. Across the region, students displayed their frustration with a government that sought to triple tuition fees, effectively pricing young men and women out of their educations. The UK government’s message was clear: Sorry, there’s not enough money for the little people. Yet, it soon became clear there should have been enough funds to cover the educations of Britain’s youth, and to provide housing for every poor man, woman and child in the country. However, there were some entities – corporations – that were committing the equivalent of economic treason, and that is why the UK is currently experiencing a shortfall in tax revenue. All the cuts in housing subsidies, driving all those people out of their homes, are part of a package of cuts to the poor, adding up to £7 billion. Yet the magazine Private Eye reported that one company alone – Vodafone, one of Britain’s leading cellphone firms – owed an outstanding bill of £6 billion to the British taxpayers. According to Private Eye, Vodaphone had been refusing to pay for years, claiming that a crucial part of its business ran through a post office box in ultra-low-tax Luxembourg. The last Labour government, for all its many flaws, had insisted it pay up. But when the Conservatives came to power, David Hartnett, head of the British equivalent of the Internal Revenue Service, apologized to rich people for being “too black and white about the law.” Soon after, Vodafone’s bill was reported to be largely canceled, with just over £1 billion paid in the end. Once news of the theft reached the people, UK Uncut’s ranks swelled. They staged peaceful sit-ins that shut down Vodafone’s stores. Following the successful protests, the group shifted its attention to one of Prime Minister David Cameron’s official advisers, Sir Philip Green. Although Green lives and works in Britain and his companies all operate on British streets, he avoids British taxes by claiming his income is “really” earned by his wife, who lives in the tax haven of Monaco. In 2005, the BBC calculated that he earned £1.2 billion and paid nothing in taxes – dodging more than £300 million in taxes. UK Uncut pointed out that the school sports partnership, one of the programs axed under Cameron’s recently implemented cuts, could have been saved if Green was made to pay his taxes. These kinds of lucid examples of corporate theft spoke to the public. More protests and occupations broke out, inspiring journalist Johann Hari to declare in The Nation that this is how the United States might build a progressive Tea Party. Here were real people exercising the method Zinn advocated his whole adult life: average people, building from the bottom up. Now, the UK Uncut movement has come to America. US Uncut just recently launched, but there are already chapters springing up across the country. The whole thing is moving faster than Carl Gibson, the director of US Uncut’s founding chapter in Mississippi, could have ever hoped for. Now, Gibson is helping to coordinate movements in twenty states. UK Uncut helped him organize a unified day of protest against the banks. He’s spoken with BBC World and The Guardian. Additionally, Gibson says certain US Uncut participants have reached out to the Service Employees International Union (SEIU) in order to bridge the divide between liberalism’s two great abandoned resource pools: the poor and labor. As part of their efforts to nurture their fledgling counterpart, UK Uncut is helping Gibson locate those easy-to-recite tax dodging figures that captured the attention of Brits everywhere. The figures shouldn’t be difficult to find. The IRS estimates that individuals and corporations currently hold $5 trillion in tax haven countries. Nearly two-thirds of corporations pay no taxes at all, and the great vampire squid, Goldman Sachs, which received $10 billion dollars in taxpayer money during the bailout, negotiated their tax rate down to one percent. The entire tax haven scam costs taxpayers as much as $100 billion per year. To help illustrate the massive hole this con game leaves in the budget, consider that President Obama made the recent decision to end the year-round Pell Grant policy in order to save $3.4 billion in 2011 and $4.2 billion in 2012. Another example: The National Endowment for the Arts (NEA) and the National Endowment for the Humanities (NEH) are braced for more than $6 million in cuts, a shortfall that could easily be made up if the US recovers just .06 percent of the annual taxes owed to it by tax haven criminals. Some of the worst corporate offenders are Hewlett-Packard, Verizon, Chevron, Ford, ExxonMobil and Bank of America. The biggest dodger is General Electric (GE), which, during a time of national economic crisis, actually made money on their tax filing in 2010. Though the company generated $10.3 billion in pretax income, it recorded $1.1 billion in tax benefits. Forbes calls this GE’s “uncanny ability to lose lots of money in the US and make lots of money overseas, where tax rates are lower.” Such activity is also known as tax dodging, but publications like Forbes prefer to avoid such shrill language. Conservatives frequently cite the fact that America’s corporate tax rate is 35 percent, which is higher than the average of other industrial countries, but that doesn’t take into account these kinds of tax evading practices. In fact, 115 companies on the S&P 500 pay less than 20 percent in taxes, and that doesn’t take into account the 37 companies, such as Citigroup and American International Group (AIG), that receive more in credits than they ultimately pay out (companies that pay less than five percent in taxes include Boeing and Amazon). In 2010, if you made between $34,001 and $82,400, your marginal tax rate was 25 percent. That means you paid more in taxes than a company like Carnival Corporation – the entity behind the floating eyesores of Carnival cruises – which, over the last five years, has paid only 1.1 percent of its cumulative $11.3 billion in profits, according to The New York Times. You even paid more if you were in either of the next two lowest income brackets. For singles earning between $0 and $8,375, the marginal tax rate is 10 percent – a positively patriotic sum considering that income won’t keep an individual above the poverty line, and yet would cause any Fortune 500 CEO to experience cardiac arrest. Despite these glaring instances of stolen revenue, the right has been marvelously successful at using astroturfing campaigns to create its Tea Party, a movement that is more likely to focus on illegal immigration than foreign tax havens (unsurprisingly, given that large corporations like Koch Industries bankrolled such endeavors). Gibson blames the propaganda from networks like Fox News for brainwashing the lower classes into fighting against their own interests, yet he’s optimistic about the future. The US Uncut web site is up and growing, as are its Facebook group and Twitter page. “It’s time for the people to speak up and do whatever we can,” said Gibson. When my Citizen Radio partner and I interviewed Zinn in his home a couple months before he died, we asked him why it’s so important for students to have an intimate understanding of history. “To me, understanding history is a matter of life and death,” he said. “If you don’t understand history, you’re a victim.” By that, he meant that if citizens didn’t understand their own history of exploitation at the hands of robber barons and tycoons, who fought for deregulation at the expense of their employees in order to accumulate larger profits, they would be doomed to repeat those tragedies. Now here we are in 2011, and an entire movement branded as a populist uprising is screaming about illegal immigrants and Obama’s birth certificate while corporations rob the country blind. Luckily, it seems as though enough sane Americans are learning the correct history lessons from their brothers and sisters in struggle. Here’s hoping US Uncut never forgets its history. US Uncut’s official website is http://www.usuncut.org/. They are also on Facebook and Twitter. A number of conservative anti-protesters attending a rally in Madison Wisconsin were asked if they knew that 2/3 of the corporations in the state of Wisconsin paid no corporate taxes. None of the ant-protesters knew that and I can’t fault them for that. I was stunned though when an ordinary looking guy responded that it is fine with him that they don’t pay taxes- otherwise they would take their jobs to China. It is hard for me to believe that working/middle class citizens of any political stripe think all corporate jobs can be outsourced and are willing to give extortionists a free pass. I believe that the US Uncut focus on corporate tax dodgers can be unifying strategy with significant economic impacts..
Annagrace: I agree wholeheartedly. 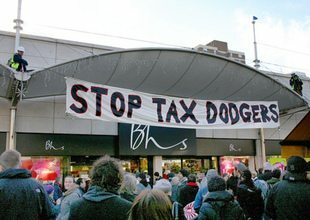 Corporate tax dodging is an issue that all but elitists can get behind. It’s shocking, it’s unfair and it’s happening like never before. Wall Street got its bailout with taxpayer money but balk at the mere mention of regulating its nefarious ways. It’s absurd that common people got involved with the Tea Party movement and elected people who thwart movements for decent pay, affordable education and accessible health care for the common people! Maybe corporate tax dodging is the rallying cry the Progressives have needed to blur the differences between the left and right. I think it can work here just as it did in the UK. Let’s do it. I’m with you completely David. Let’s do it! My family for the most part and many friends do not agree with my politics, but I do not believe that they can give a heartfelt argument on behalf of Bank of America and Halliburton and Exxon. Companies that operate in the UK pay tax upon their UK profits, they pay VAT, they pay national insurance on their UK staff’s salaries and those staff pay income tax. They will pay local business rates on their premises. The issue many people have is with tax rules that basically allow you to massively reduce your tax liability in the UK (and elsewhere) by various methods, often involving loans. Loan interest payments aren’t taxed (quite sensibly) but this can be abused by using an offshore headquarters. So the owning company is based in the British Virgin Islands “lends” lots money to its UK subsidiary which makes regular interest payments back to the owning company. Those interest payments happen to coincide with the profits the British subsidiary makes, which basically reduces its profits to 0 and therefore reduces its tax liability massively. The BVI company has very healthy profits but in a country that doesn’t tax them. It gets much more complicated but that is basically the idea. Google “sold” various technology rights to their European subsidiaries and receive interest payments back, hence their low tax rate. The real kicker is that these Headquarters that are making all the profits and pay zero tax are often held under nominee directorships, so you cannot find out the real private owners.. The bank address for the offshore Headquarters company can be anywhere. It does not have to also be in the off shore country. The company nominee directors have direct access to this bank account to do what they want. This is because the offshore havens do not require the accounts to be audited or even for accounted to be submitted in general. Ironically the “EU Tax savings directive” passed in 2008 stopped the ability of private individuals to do this. They did this by forcing all countries banks to expose all persons accounts everywhere to the other governments. This was lead by the main progressive tax countries of course to stop personal tax liabilities moving off shore and to avoid paying tax in high tax countries. Just what companies are stil allowed to do. Its painfully ironic what is going on. Think about he scale of the damage this causes and the ripple effects it has and its staggering. Talk to any London accountant you have known for 5 or more years and they will tell you this in detail. If you don’t have a long standing relationship with them then they are unlikely to discuss this dirty laundry with you.